A group of scientists at the University of Strathclyde has devised a new laser-accelerated ion energy scheme which has the potential to offer innovative applications in the field of the science, industry as well as medicine. Their research pointed that the acceleration of the protons can help in generating emerging equivalent to 100-mega-electron volts range. But this happens only in a controlled condition wherein the hybrid ion acceleration scheme is applied on a very small target and it is powered by an intense laser pulse. This research will certainly help in finding new ways of bringing the advanced laser driven ion accelerators for application in the modern technology, consumer electronics and other areas. Researchers had published their finding the in the popular science journal named Nature Communications. The lead researcher on this project, Professor Paul McKenna from the University of Strathclyde, laser-accelerated ion energy have a huge transformative potential because of their compact natural state and the unique properties which were found when the laser beams interacted and cause the radiation. It is worth pointing out that the particle accelerator has caused a massive impact on the society and the way science is perceived in the modern era. It has also been seen as a the mere basis of the new innovative approaches made in the field of the cancer treatment apart from offering wide variety of invaluable tools in the field of science of and biology. The laser-accelerated ion energy will also bring similar amount of innovative application in the upcoming days. This study in laser-accelerated ion energy is being conducted by a team of scientist’s collaborating together from some of the prestigious institutions in the world. It includes Queen’s University Belfast, University of Strathclyde, Shanghai Jiao Tong University and STFC Central Laser Facility. Funding for this project has been provided by EPSRC or Engineering and Physical Sciences Research Council while the experiment is being conducted at the Science and Technology Facilities Council’s (STCFC) Central Laser Facility based in Oxfordshire. Before conducting the tests researchers has conducted a number of simulation at the Strathclyde and Edinburgh’s high performance computers. There were a number of challenges faced by the researchers during the experiment which made work quite difficult for them. One major challenge faced by them revolved round carefully optimising the individual acceleration mechanism. 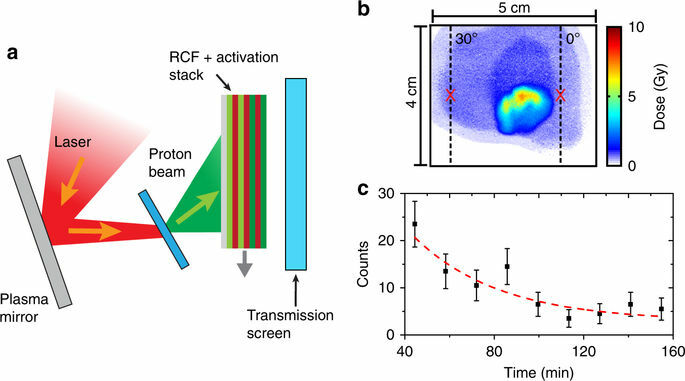 It should be noted that ions are accelerated in this experiment using the intense lasers which results in creating a highly ultrafast process happening for a very short duration. It isn’t possible for the team to carefully optimize the individual acceleration mechanism in order to analyse the laser pulse and the whole process itself. As they are unable to optimize laser-accelerated ion energy in this research showed that it led to the development of hybrid schemes within it which involved two or more acceleration mechanisms with ease and grace. This very development also allowed the scientists to get a certain degree of control over the final ion beam properties.